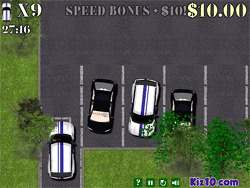 It is a parking game designed by kiz10, it is just like a test for your parking skills. Your role is the game is a parking attendant, in face of the continuous arriving cars, can you complete the parking task as quickly as possible? It is absolutely a well designed game. Don’t look down upon the easy task, it could be much more challenging than you could image now. Actually, this is one of the game that could deal with the 3D effect so well. Have a try and it might have a little influence for your real parking skills. You can play Super Valet Parking free online car games at fogames. It has tags: Driving,Car,Parking,. It has 2406 total plays and has been rated 79.9% (5 like and 3 dislike), find the fun and happy day. If you want to play more car games, we find some of the game: Parking Super Skills, Valet Parking, Valet Parking 3D and Valet Parking Pro. To play other games, go to the driving games page, the car games page, or just check out the new games or best games page. Play Super Valet Parking online games, Fun and Happy.